jParallax turns nodes into absolutely positioned layers that move in response to the mouse. Depending on their dimensions these layers move at different rates, in a parallaxy kind of way. With a bit of CSS you can either set up windows to see these layers through, or leave them free to roam about. demos/remotecontrol.html - parallax by remote control. demos/thumbnails.html - beautiful interactive thumbnails. demos/target.html - demonstrates how smoothly jParallax handles window resizing. The default behaviour of jParallax is to show the whole width of a layer in response to the mouse travelling the whole width of the mouseport. When the mouse is moved to the extreme left-hand side of the mouseport the left-hand side of the layer meets the left-hand side of its viewport, and when the mouse is moved to the extreme right-hand side of the mouseport the right-hand side of the layer arrives at the right hand-side of its viewport. 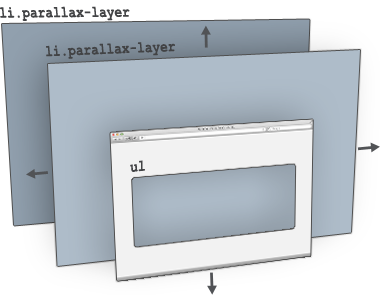 Therefore, the simplest way to use jParallax is to make the layers different sizes using CSS. Bigger layers move faster (and thus appear closer), and unless a layer is smaller than the viewport, its edges are never seen. The Colour Drops Demo is made in exactly this way, with jParallax in its default state, and the 'speed' of the layers controlled simply by making the images different sizes. Only the mouseport option is defined, to make it the same as the viewport. There is a basic stylesheet included with the download that provides these classes, and the demos are a good reference for some other effects you can achieve. We all like tweaky-tweaky. jQuery.parallax also provides options and event bindings that give you control over a layer's behaviour. Identifies DOM node to track the mouse in. Set to true or false to enable or disable movement. Alternatively, to control the range over which a layer travels, either pass in an absolute value in pixels, or a scaling factor in the range 0-1 (scaling factors can also be expressed as percentage strings). Scaling factors outside this range are also accepted, but be aware that factors below 0 (or '0%') will reverse the direction of travel, and greater than 1 (or '100%') will make layer edges appear inside the extremes of the viewport. Only meaningful when xparallax or yparallax are not 1. Determines which point of the layer lines up with which point of the viewport when the mouse is at that point in the mouseport. Got that? It's easy really. It's the same behaviour as the css property background-position. If xorigin is set to 0 (or 'left'), then when the mouse is moved to the left hand side of the mouseport the left hand side of the layer arrives at the left hand side of the viewport. If it's set to 0.5 (or 'center'), then when the mouse is at the centre of the mouseport the centre of the layer is aligned with the centre of the viewport. And similarly with 1 (or 'right'). Numbers outside the range 0-1 may also be used. Class set on a layer when it is frozen. Sets the rate at which the layers 'catch up' with the mouse position. 0 is instantly, 1 is forever. Length of time between animation frames. With a lot of big layers, you may want to increase the frame duration to save CPU. About 50 is acceptable (20 frames/second), but I like it zippy. Modern browsers like Google Chrome have really accurate timing, but many older browsers choke below about 15ms. Values for layer dimensions, normally read from css, can be overridden. This does NOT change the size of the layer, only jParallax's idea of how big it is. This can be very useful in cases where you want to be able to 'click through' the upper layers. Typically you make layers very small in css, but tell jParallax they are big via the width and height options. A layer option object can have the properties xparallax, yparallax, xorigin, yorigin, width and height, with the same meanings as described above. Stops the layer from moving. Use the optional event object properties to send the layer to a specific position: x and y tell a layer where to go (expressed as a ratio of the width of the viewport in the range 0-1), and decay how fast to go there ( where 0 is immediate and 1 is forever ). When the layer comes to rest the class 'freeze' is given to the layer. freezeClass is setable in the options object. Should be 'thaw', I suppose, really. That sounds weird, though. Unfreeze sets the layer in motion again. Let me know if you have a site that uses jParallax - tweet me @stephband. Lots of transparency in images will slow down a browser's ability to render quickly. Avoid making huge layers of semi-opaque graphics if you don't want lesser browsers to choke.